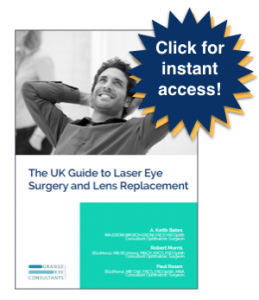 Refractive lens surgery is an operation and all operation carry risk. There could be technical problems at the time of surgery, but most of those are addressed by a skilled and expert surgeon, such as we are at Grange Eye Consultants. One of the more serious complications which is rare is infection. But infections can be treated, provided we see you early. And one of the important things that we do is that we educate you as of what the symptoms of an infection or other complications following surgery might be. And we have a 24-hours emergency service so that if you have any concerns we can talk to you and if we’re concerned we arrange to see you and treat whatever the problem is.